Background: For patients with chronic obstructive pulmonary disease (COPD), an increase in exercise tolerance and ability to perform activities of daily living (ADLs) can mean an improved quality of life with fewer exacerbations and lower health care expenses. We evaluated a wearable, noninvasive open ventilation (NIOV) system designed to enhance exercise capacity and increase mobility. Methods: Patients with stable, oxygen-dependent COPD were recruited for this prospective, open-label, crossover study. Inclusion criteria included supplemental oxygen use, elevated dyspnea score, and the ability to perform ADLs. Patients performed a selected ADL for as long as tolerable while using standard oxygen therapy. Following a rest period, the same ADL was repeated using the NIOV system. ADL endurance time, oxyhemoglobin saturation measured by pulse oximeter ( SpO2), dyspnea, fatigue, and discomfort scores were recorded. Results: Thirty patients were enrolled and 29 patients completed the study. Mean ADL endurance increased by 85% (13.4 vs. 7.2 min) using NIOV compared with oxygen therapy (p<0.0001). 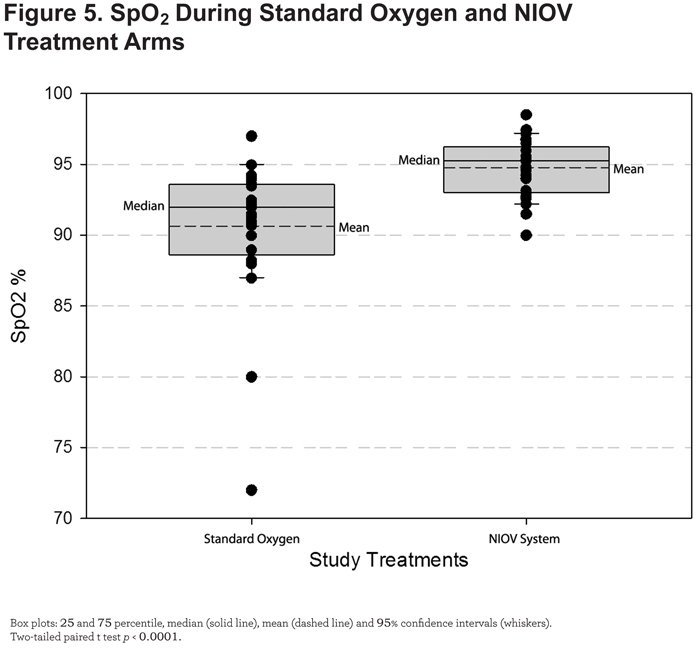 Mean SpO2 was significantly higher during ADLs using NIOV versus oxygen therapy (p<0.0001). Median dyspnea, fatigue, and discomfort scores were significantly lower using NIOV during ADLs compared to oxygen therapy (p<0.01). No device-related adverse events were observed. Conclusions: This study demonstrated that a novel, portable noninvasive open ventilation system can improve ADL performance in the home setting. 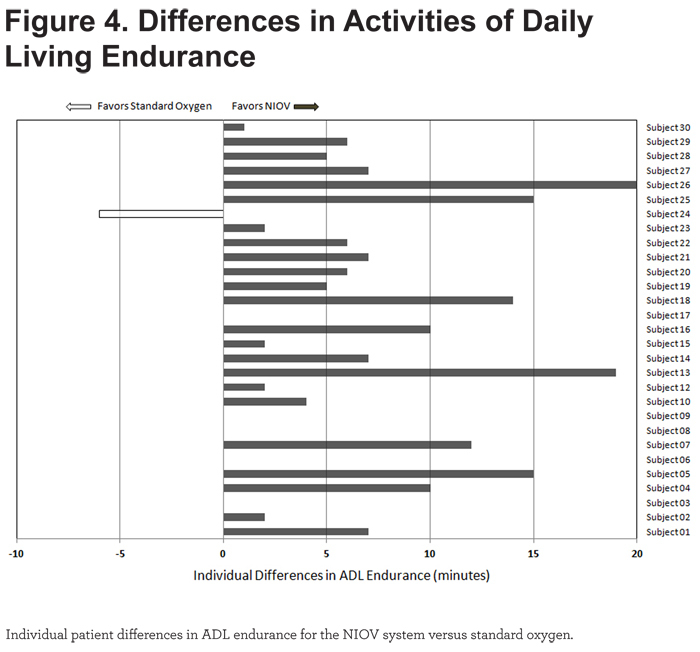 Compared to standard oxygen therapy, the NIOV system provided statistically and clinically significant increases in ADL endurance time and oxygenation, while decreasing dyspnea, fatigue, and discomfort. The NIOV system appears to offer a practical option for increasing activity and exercise tolerance in oxygen-dependent patients with COPD. Funding Support: This study was sponsored by Breathe Technologies, Inc; Irvine, California. Multiple, interrelated pathophysiologic factors play a role in the exercise intolerance observed in patients with COPD5 including ventilatory impairment, gas exchange limitations, muscle fatigue, and anxiety - all of which can contribute to the overarching symptom of dyspnea.29 The degree to which each factor is involved can vary widely between patients as well as between different types of activity.30 Thus, treatments aimed at increasing exercise tolerance and minimizing dyspnea often utilize disparate approaches and mechanisms of action to accomplish their goal. Exercise and ADLs frequently involve ambulation, hence, therapies designed to enhance these activities should be practical for mobile use. In the case of supplemental oxygen, major strides have occurred in the last 2 decades making portable oxygen feasible for everyday use, with numerous devices now available.31-33 However, supplemental oxygen alone may be insufficient to address the exertion-related stresses associated with ventilatory insufficiency,34-36 and the same progress in device portability has not taken place in the area of noninvasive ventilation (NIV). In 2007, Dreher and colleagues26 demonstrated that NIV used during walking could significantly improve oxygenation, dyspnea, and walking distance in patients with very severe COPD. Since the ventilator used in their study was large and heavy, the authors electively placed the unit on a wheeled cart during walk testing. In a later study performed at the same center, patients with COPD were again walk-tested using NIV. This time, however, patients were asked to carry the ventilator system (weight=7.3 kg) in a backpack during walking, and a markedly different outcome was observed.37 Although NIV with supplemental oxygen still improved in-walk oxygenation compared to oxygen therapy alone, dyspnea scores remained unchanged and walk distance worsened by 64 meters. The authors attributed the poor study outcome to the burden imposed on patients of carrying the heavy ventilator system noting that, "more practical and acceptable forms of [ambulatory] ventilatory support" need to be developed. In the current study, we evaluated the effects of a recently available, wearable, noninvasive ventilator compared to standard oxygen therapy during ADLs in patients with COPD. Based on prior clinical data using this noninvasive ventilator system,38-40 we hypothesized that it could improve oxygenation, comfort, dyspnea, and ADL endurance versus standard supplemental oxygen. Patients with stable COPD were identified and recruited for this at-home study by accessing the database of a durable medical supplies and services company (Klingensmith Healthcare; Ford City, Pennsylvania). Inclusion criteria included current use of supplemental oxygen during rest and exertion, self-reported dyspnea-related activity limitation, and ability to perform ADLs such as walking, cleaning, and climbing stairs. Current tobacco smokers were excluded, as were patients with acute respiratory symptoms, or those with a recent hospitalization. The study received institutional review board (IRB) approval, and patients signed an IRB-approved informed consent form (IRB No. 201102606, Schulman Associates, Inc; Cincinnati, Ohio). The study was registered on ClinicalTrials.Gov (http://clinicaltrials.gov; NCT01347931). 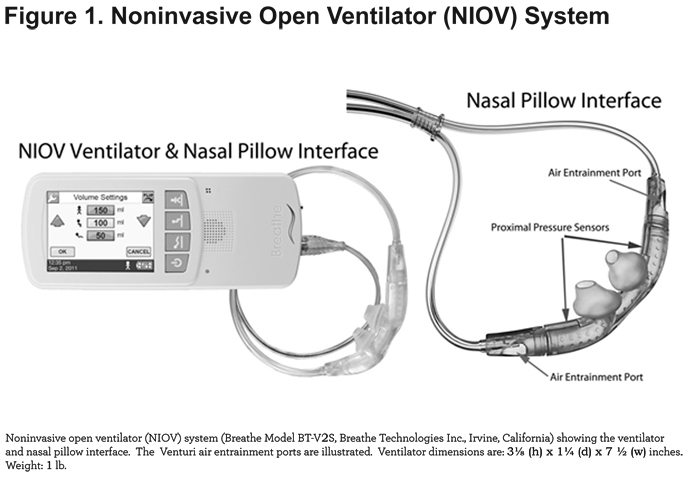 The noninvasive open ventilation system (NIOV) system (Breathe Technologies, Inc; Irvine, California) is Food and Drug Administration-cleared and is designed to provide breath-actuated, tidal volume augmentation and oxygen to adults with respiratory insufficiency. The system consists of a wearable, 1 pound ventilator, and an open, non-sealing, proprietary nasal pillow interface (Figure 1). When attached to medical grade, compressed oxygen, the ventilator delivers a preset volume of oxygen ranging from 50-250 mL during the patient’s inspiratory phase. In addition, room air is entrained during volume delivery by way of 2 Venturi ports located on the nasal interface. Depending on the volume setting and factors such as lung compliance and resistance, the total augmentation volume delivered (i.e., oxygen + entrained room air) can exceed 450 mL.41 Since the patient's air path retains continuous access to ambient air via the Venturi ports, the ventilator and nasal interface are considered to comprise an open system. Ventilator inspiratory time is set as a function of the total breath cycle time, and is adjustable from 10% -40%. Trigger sensitivity is adjustable from 0-9, corresponding to a pressure range of -0.01 to -0.34 cm H2O. This was a prospective, non-randomized, open-label, 2-arm, crossover study, conducted in the home setting. Patients completed a single study day, lasting up to 3 hours. At-home testing and data collection were performed and/or supervised by a registered respiratory therapist. Study measurements included height, weight, blood pressure, heart rate, respiratory rate, ADL endurance time, SpO2 (WristOx2 Model 3150, Nonin Medical, Inc; Plymouth, Minnesota), Borg dyspnea score,42 an 11-point visual analog fatigue score, and an 11-point visual analog discomfort score (Figure 2). On the day of testing, patients were oriented to the NIOV system, which included a fitting with the NIOV nasal pillow interface and optimizing the ventilator's volume, inspiratory time %, and trigger sensitivity settings for both rest and activity. For the oxygen treatment arm, patients utilized their existing nasal cannula at their prescribed flow rates for rest and exertion. Approximately 5 minutes before each test, baseline values were collected for SpO2, heart rate, respiratory rate, dyspnea, fatigue, and discomfort. Patients were asked to perform a self-selected ADL (e.g., walking, stair-climbing, cleaning) for as long as tolerable while using standard oxygen therapy. Following a rest period of at least 15 minutes during which SpO2 and other physiologic parameters were allowed to return to baseline, patients repeated the same ADL, this time using the NIOV system for as long as tolerable. Respiratory rate, heart rate, ADL endurance time, SpO2, dyspnea, fatigue, and discomfort scores were monitored and recorded for each test. The primary study outcome measure was ADL endurance time. Secondary endpoints included SpO2, dyspnea, fatigue, and discomfort scores. A per-protocol approach was used for data analyses. Per-protocol was defined as having at least minimal use of both study treatments. A sample size of 26 patient pairs was determined based on the assumption of a true treatment difference in mean ADL endurance time of 4 ± 7 minutes using a 2-tailed, t test (α=0.05, power=0.80). Statistical assessments were performed using ProStat 5.0 (Poly Software International; Pearl River, New York). Differences between treatment arms for ADL endurance and SpO2 were assessed using a 2-tailed, paired t test. 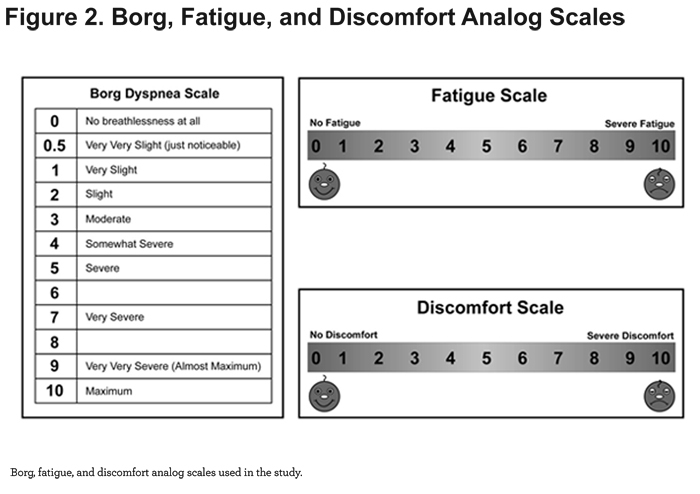 Differences between treatment arms for dyspnea, fatigue, and discomfort scores were compared using a 2-tailed, Wilcoxon matched-pairs, signed-ranks test. Statistical significance was accepted as p < 0.05 for all analyses. Data are presented as mean ± SD unless otherwise noted. Thirty patients with stable COPD were enrolled between October 2011 and March 2012. Twenty nine patients successfully completed both study treatment arms. One individual (S-11), was unable to use the NIOV system due to nasal congestion and rhinorrhea, and her data were excluded from the efficacy, but not the safety analyses. 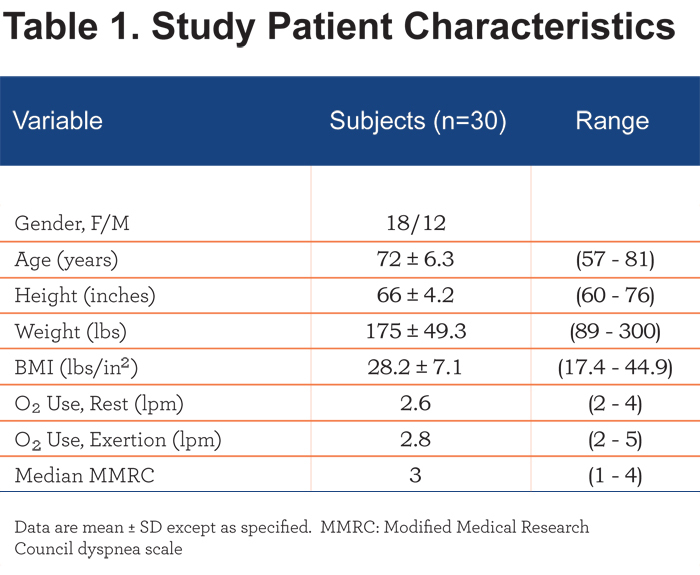 Descriptive characteristics of the 18 female and 12 male patients are summarized in Table 1. 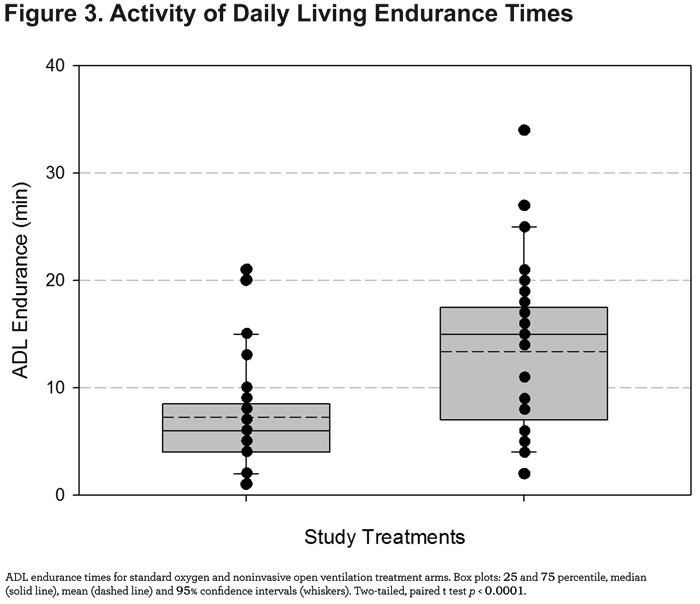 Mean ADL endurance time was significantly longer (6.1 minutes, p < 0.0001) using the NIOV system versus standard oxygen therapy (Figure 3). 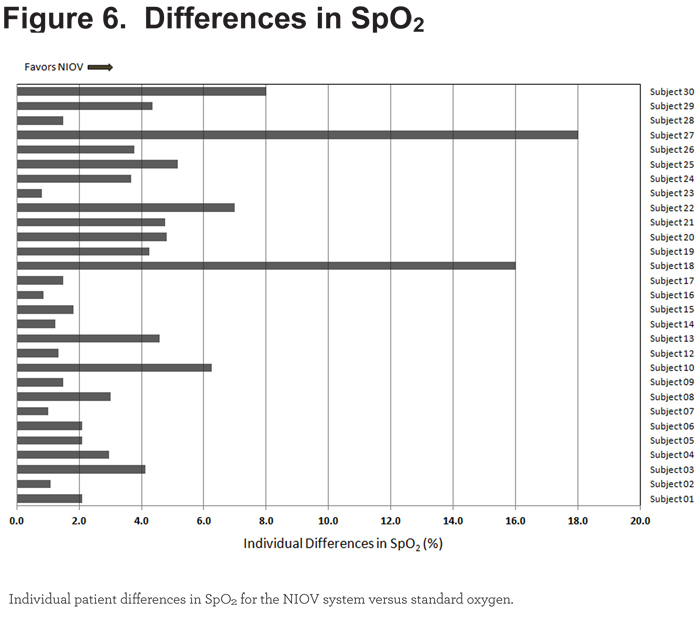 Of the 29 patients completing both treatments, all but 1 showed greater endurance on the NIOV system versus standard oxygen (Figure 4). SpO2 was significantly higher (4.1%, p < 0.0001) during ADLs performed using the NIOV system compared with standard oxygen therapy (Figure 5). All 29 patients demonstrated better oxygenation levels while using the NIOV system (Figure 6). 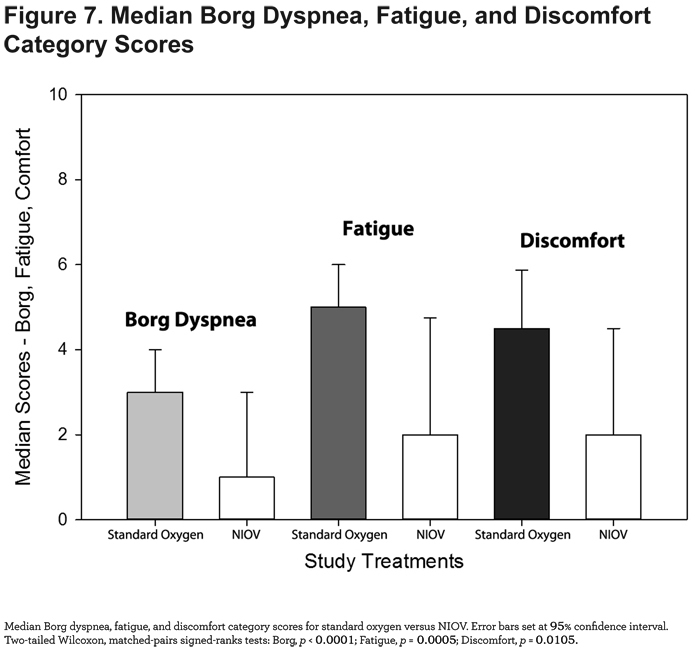 Median dyspnea, fatigue, and discomfort scores were significantly improved when using the NIOV system compared to standard oxygen therapy (Figure 7). 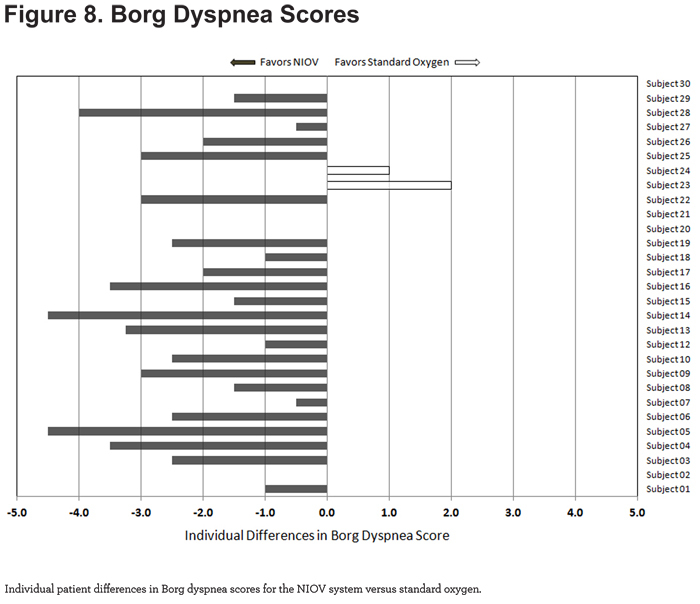 For Borg dyspnea scores, 23/29 patients showed less dyspnea using the NIOV system (Figure 8). 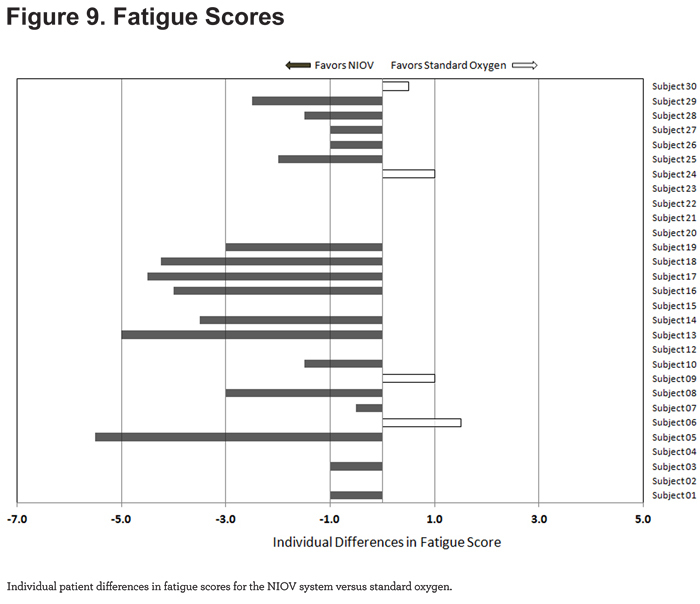 For fatigue scores, 17/29 patients reported less fatigue while using the NIOV system (Figure 9). 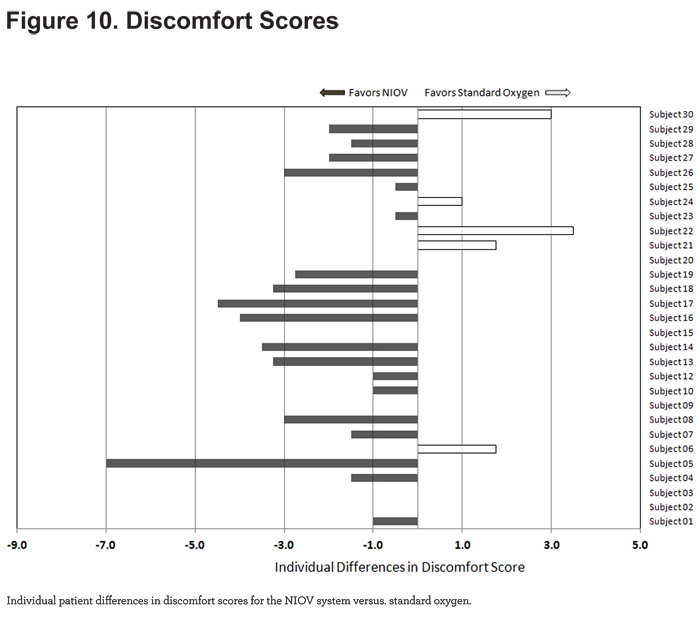 For discomfort scores, 19/29 patients reported less discomfort while using the NIOV system (Figure 10). An overall summary of the comparisons are described in Table 2. One patient did not show improvement in any of the parameters studied with the use of NIOV therapy. Two patients did not show a response in regards to both fatigue and discomfort. No clinical correlations could be made in these 3 patients regarding lack of response to therapy compared to those patients who did show a response to therapy. A single adverse event was observed during the study (S-11, nasal congestion with rhinorrhea), which did not require treatment, and was deemed unrelated to the study interventions. The NIOV system was well tolerated and received positive comments indicating the device and nasal interface were comfortable to wear. In the previously described study by Dreher et al,26 with NIV (with the ventilator on a wheeled cart) the improved mean 6MWD increased by 43 meters, the Borg dyspnea score by 2 points and arterial oxygenation by 10.4 torr in patients with very severe COPD. Borghi-Silva et al43 compared NIV with standard supplemental oxygen during pulmonary rehabilitation in patients with COPD and reported that NIV increased 6MWD by 75 meters and improved dyspnea and SpO2 versus standard oxygen. van’t Hul and colleagues44 showed improvements of 13% in shuttle walk distance and 76% in cycle endurance using noninvasive inspiratory pressure support versus sham ventilation in patients with COPD. Using the same NIV system described in the current study, Porszasz et al45 reports that compared to standard nasal cannula oxygen, NIOV significantly improved mean exercise tolerance (11.4 minutes vs. 17.6 minutes) and SpO2 (92.7% vs. 98.5%), while decreasing respiratory muscle activation in patients with severe hypoxemic COPD undergoing constant work rate cycle ergometry. Emtner et al, using supplemental oxygen during constant work rate exercise in non-hypoxemic patients with severe COPD, showed a 4-minute (38%) improvement in exercise endurance, but no change in dyspnea compared to room air.11 Jolley et al,49 evaluating the effects of supplemental oxygen in patients with severe COPD, also reported mixed results. In desaturators (patients showing SpO2 drops of at least 5% and < 90% during walking), oxygen increased the mean walk distance by 59 meters (22%) and improved dyspnea scores by 2 points. For non-desaturators, oxygen therapy only improved dyspnea. In a study of patients with mild-to-severe COPD, Fujimoto et al50 reported that while supplemental oxygen improved SpO2 in all patients, only patients with moderate and severe disease showed increases in 6MWD (24 meters and 32 meters, respectively). In the current study, the NIOV system increased ADL endurance by 85% and absolute SpO2 by 4.1%, while significantly decreasing symptoms of dyspnea, fatigue, and discomfort in patients with chronic respiratory insufficiency and exercise intolerance. In a prior clinical trial in patients with oxygen-dependent lung disease (NOVEL-1),40 the NIOV system increased the mean 6MWD by 57 meters more than the mean 6MWD of patients using nasal cannula oxygen. A follow-up study of 32 patients with severe, oxygen-dependent COPD (NOVEL-2),39 reported that the 6MWD improved by 36 meters while using NIOV compared to using standard oxygen therapy, with a subset of patients (baseline 6MWD < 300 meters) improving by 73 meters. In a study to evaluate ease of use, comfort, and preference, 18 patients with severe COPD used the NIOV system for 5 days and found it to be easy to use, comfortable, and indicated a strong preference (median Likert score = 5/5) for using the NIOV system over their standard oxygen systems for performing errands, household tasks, and exercise.38 These data, demonstrating improvements in ADL endurance, 6MWD, oxygenation, symptom scores, and preference for use, support the idea that the NIOV system can provide comparable, and in some cases, superior benefits compared to other treatment modalities in patients with advanced chronic lung disease. Clearly, adjunctive treatments are available that can enhance exercise capacity, improve dyspnea, and potentially increase the benefits of pulmonary rehabilitation. Unfortunately, other than supplemental oxygen therapy, treatment modalities such as standard noninvasive ventilation and heliox have limited applicability for ambulatory use. Conversely, oxygen therapy, while highly portable, is often insufficient to meet the needs of patients with significant ventilatory insufficiency. Thus, mobile devices that address both oxygenation and ventilation needs, and that can be broadly applied to enhance activity levels and increase exercise tolerance, are greatly needed. Increasing physical activity and exercise endurance in patients with COPD has significant socioeconomic implications. In a 20-year, longitudinal study of nearly 2400 patients with COPD, Garcia-Aymerich et al3 reported that physical activity levels equivalent to walking or cycling for at least 2 hrs/week were associated with a 30%–40% reduction in the risk of COPD-related hospital admissions and mortality. In an earlier study, patients with COPD who were active at least 1 hour/day had significantly lower risk of exacerbations and hospitalizations compared to patients with activity levels ≤ 20 min/day.51 These findings are important as COPD carries with it high social and economic costs. Specifically, in 2001, COPD in the United States was responsible for 16 million physician visits, 500,000 hospitalizations, 110,000 deaths, and 18 billion dollars in health care expenditures.52 Therefore, treatments that can effectively increase activity levels and improve long-term outcomes, can result in reductions in health care spending and in the overall burden of COPD. Although suggestions were provided to patients regarding suitable ADLs to perform, they were allowed to choose which activity was executed. Due to the wide variety of different activities selected, more direct comparisons between patients were not possible. However, given that the intent of the study was to evaluate a "real world" application of the NIOV system by allowing patients to perform a normal activity in the comfort of their own homes, this seemed to constitute a reasonable compromise. Data collected for this study occurred during a single at-home visit, which has obvious limitations for drawing conclusions about long-term outcomes. To address this, plans for a larger, long-term, randomized controlled trial to collect data on device utilization, pulmonary function status, and detailed health-related quality of life measures are currently under consideration. We evaluated a new, portable noninvasive ventilator and nasal interface system to determine the effects on the performance of typical ADLs in oxygen-dependent patients in their home environment. 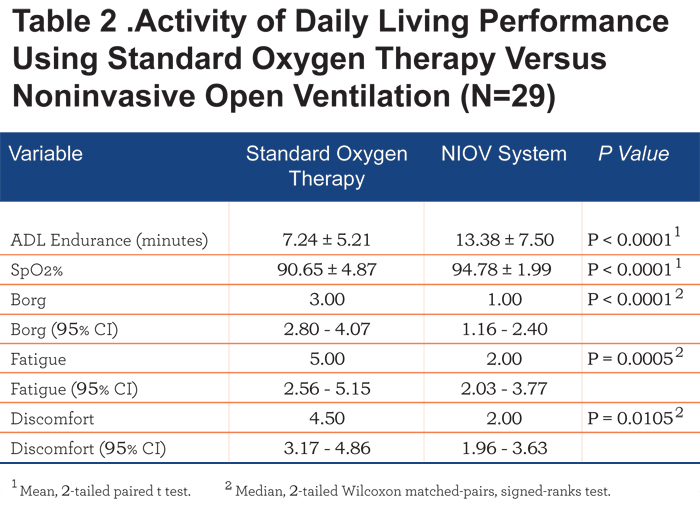 NIOV use resulted in statistically and clinically meaningful improvements in ADL endurance, oxygenation, dyspnea, fatigue, and comfort, compared to standard oxygen therapy. Thus, the NIOV system appears to provide a practical option for increasing physical activity levels in patients who suffer from chronic respiratory insufficiency. Author contributions: All authors had complete access to the data and reviewed and approved the manuscript. BWC served as principal investigator and takes responsibility for the integrity of the data and the accuracy of the data analysis. He contributed to the study concept and design and interpretation of the data. KSW and RWM contributed to data acquisition, the study concept and design and interpretation of the data. TB also contributed to data acquisition and interpretation of the data DE contributed to the study concept and design. RJM contributed to the study concept and design and interpretation of the data. The sponsor, Breathe Technologies, assisted in the design of the study, the analysis of the data, and in the preparation of the manuscript including being involved in the draft of the manuscript and reviewing it in its final form regarding publication of proprietary information. No information was deleted. The authors gratefully acknowledge the patients who volunteered to participate in this study and their families. RWM serves as a consultant to Breathe Technologies, Inc., which manufactures the NIOV system used in this study. RJM was an employee of Breathe Technologies, Inc. BWC, KSW, TB and DE report no potential conflicts of interest regarding companies or products discussed in this manuscript. 6. Lacasse Y, Goldstein R, Lasserson TJ, Martin S. Pulmonary rehabilitation for chronic obstructive pulmonary disease. Cochrane Database Syst Rev. 2006(4):CD003793. 9. Gimenez M, Servera E, Vergara P, Bach JR, Polu JM. Endurance training in patients with chronic obstructive pulmonary disease: a comparison of high versus moderate intensity. Arch Phys Med Rehabil. 2000;81(1):102-109. 13. Chiappa GR, Queiroga F, Jr., Meda E, et al. Heliox improves oxygen delivery and utilization during dynamic exercise in patients with chronic obstructive pulmonary disease. Am J Respir Crit Care Med. June 1, 2009 2009;179(11):1004-1010. 14. Palange P. Lighter than air: heliox breathing improves exercise tolerance in COPD. Eur. Respir. Rev. March 1, 2010 2010;19(115):1-3. 31. Dunne PJ. The clinical impact of new long-term oxygen therapy technology. Respir Care. 2009;54(8):1100-1111. 36. Strickland SL, Hogan TM, Hogan RG, Sohal HS, McKenzie WN, Petroski GF. A randomized multi-arm repeated-measures prospective study of several modalities of portable oxygen delivery during assessment of functional exercise capacity. Respir Care. 2009;54(3):344-349. 38. McCabe L, Cayou C, Hilling L, Kops R, Heron G, Morishige R. Use of a novel non-invasive open ventilation system during rest, activities of daily living, and exercise in patients with severe COPD. Am J Respir Crit. Care Med. 2012;185:A5783. 40. Hilling L, Cayou C, Wondka T, Kops R. Improved 6MWT distance with a highly portable non-invasive ventilator. Am J Respir Crit Care Med. 2010;181:A1198. 41. Wiles K, McCoy R, Brennan T, Carlin B. Augmented ventilation assistance to improve activities of daily living: a case study. Abstract presented at the American Association for Respiratory Care Congress 2012: Sunday, November 11, 2012, New Orleans, Louisiana. 43. Borghi-Silva A, Mendes RG, Toledo AC, et al. Adjuncts to physical training of patients with severe COPD: oxygen or noninvasive ventilation? Respir Care. 2010;55(7):885-894.